Abstract: In this article, we will see a very simple use case of using HTML 5 Geo-Location API from the spec along with Bing Maps in an ASP.NET MVC app. When talking about Geo-Location, it’s difficult to keep Maps out. Fortunately for us, both Bing and Google have a very extensible Mapping framework already available for us to use. Today we will use Bing’s Ajax based mapping framework to calculate driving directions between the user and center of San Jose, CA and also visualize it on the Map. 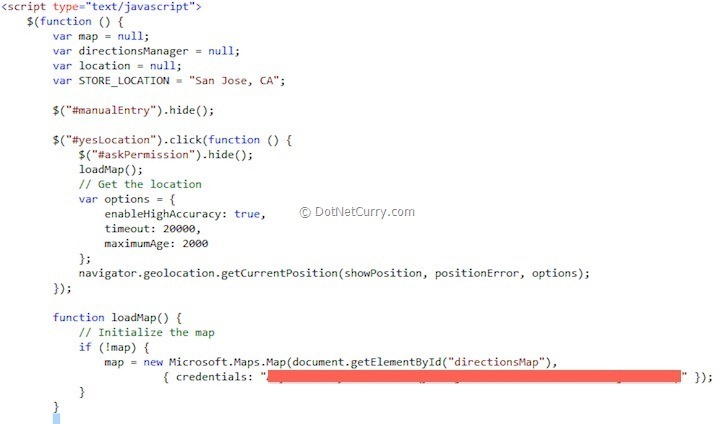 Before we start using the mapping framework, you need to login to the Bing Maps developer portal and get an API Key. You can login using any Live Id like your Hotmail account. With that minor logistics out, we’ll go pedal-to-metal with code. In this example, we are going to solve a hypothetical problem where we are building the ‘Directions’ page for a super-store. We know the address to our super-store and for simplicity sake, there is only one address. If user gives us access, great! We’ll calculate the route using Bing’s API and show the route between user’s detected location and the super-store on a Bing map. If user does not give us access, we will request them to provide us with an Address and try to get the directions between the two locations. Let’s walk through the steps to build this application. Step 1: Create new ASP.NET MVC project in Visual Studio. Step 2: Edit Index.cshtml add the following elements to it. - Update the Heading to ‘Directions to Super Market’. - <div> container with id askPermission contains the elements that ask user for access to location information and get their input. - <div> container with id manualEntry contains the elements to get address manually and a button to fire off the search. - <div> container with id mapContainer has two child <div> elements. One shows the Bing Map control and the other the Direction details. Step 4: Now we start adding our presentation logic to manipulate the map as per user input. map – object that holds the instance of the Bing Map. Next we hide the <div> container for manual entry and we hook up the click event handler for the ‘Yes’ button through which user gives us permission to use location services. We hide the <div> container that had the request for permission. Next we call the loadMap() method that we will see below. Next we create an options object requesting the location API to enable high Accuracy if possible, set a time out of 20 seconds and maximum age of the value to 2 seconds. The Accuracy and maximumAge are more important from the prospect of tracking a moving location and is kind of redundant here. Finally we call the API to get the location placing two callbacks to handle success and failure. 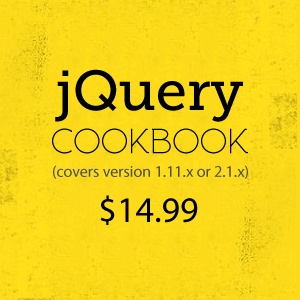 We pass the <div> element that is supposed to contain the map. We pass credentials in form of our API key that we obtained from Bing Maps portal. For now, we will follow the path where user has allowed our app to access location services. We will come back to the second path once this path is completed. - The showPosition(…) method is called once the location is retrieved successfully. The input param is checked for null and if not null, the map is setup to center at that location. Thereafter we check if our directionsManager has been initiated or not. 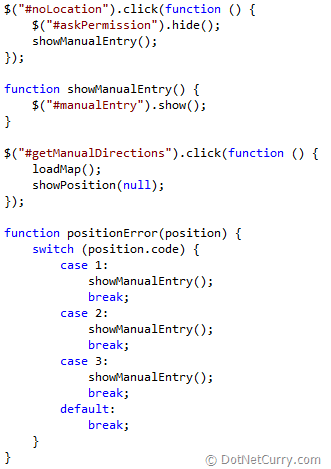 If not, the Directions module is actually loaded handed a callback method that creates the directionManager. 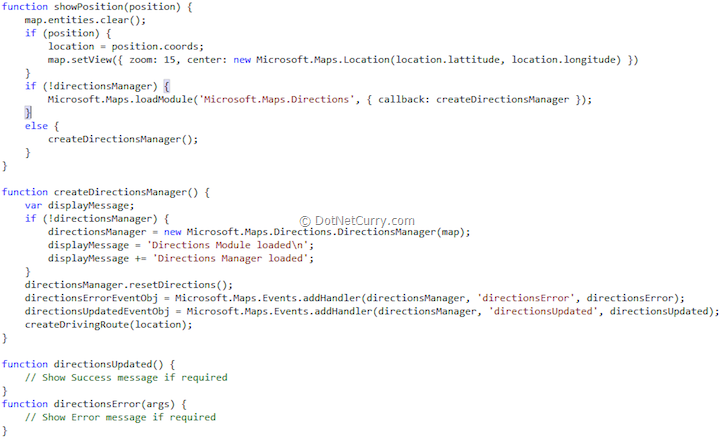 - Finally we call the createDrivingRoute(location) method to draw the route on the map itself. 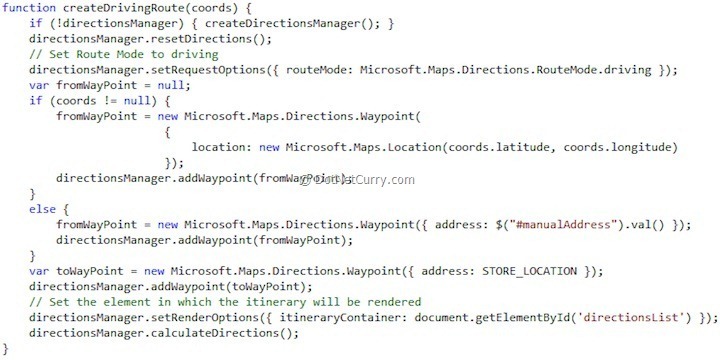 The createDrivingRoute(coords) method calculates the route between the user location and the static address and gets the Map control to draw it for us. - It checks if directionManager is instantiated and if not instantiates it. - Next it sets the routeMode to driving. Other possible modes are public transport and walking. - Next it sets up the destination point using the static address STORE_LOCATION. - Next the direction manager is passed the element that it should use to render the direction details. - Finally the direction manager calculates the directions and adjusts the map accordingly. It simply hides the question and shows the manual entry panel. showPosition(null) – By passing null to showPosition, we are implying we don’t have the exact location thus the createDrivingRoute method eventually uses the text provided by user in the address text box. All Set, let’s run the solution! You can try out all the possible combinations. 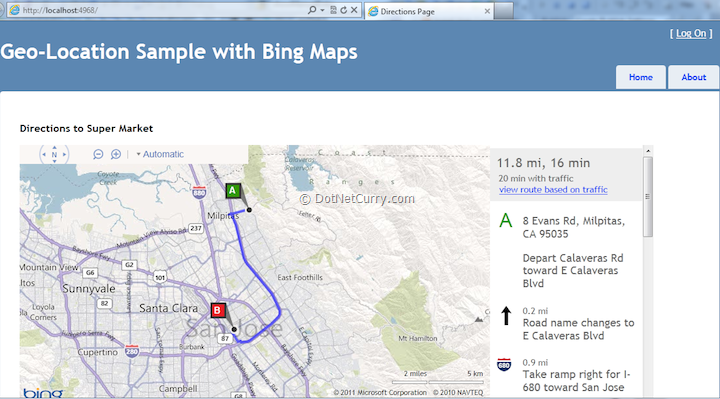 We saw a very simple use case of using HTML 5 Geo-Location API from the spec along with Bing Maps in an ASP.NET MVC app. The links in the reference section has a sample site of possible Bing Map applications. On the other side, we have the simple Location API that’s powerful, but to be successful, the user needs to be softly introduced to it so that they trust you and your application. Have fun and let us know what creative solutions you come up with the location API. To demonstrate the geo-location API we have explicitly called to get the browser’s location API. The Bing Maps control contains an alternate mechanism to get user location as well. Your information is very useful for me. Hi! Nice post. I learn something more challenging on different blogs everyday. It will always be stimulating to read content from other writers and practice a little something from their store. Your tutes are both understandable and useful. I love your mag.